If I was a super villain with an octagonal lair with a massive octagonal aquarium in the center of it with a giant eight armed octopus living in it, I would most likely have majestic entrance doors with these cool new Octopus Door Handles attached. 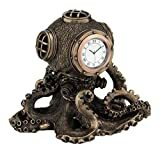 Yep, these huge octopus arm door handles are handcrafted in Paris from high quality resin with either a charge of brass or aluminum powder and then brushed with a handmade patina. The brass finish is limited to 100 pieces and the silver to 150 and both are signed by the artist Gregory Besson. 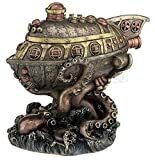 Besides making any double door more epic, this pair of octopus arm handles can also be used on furniture, such as a liquor cabinet, again for my octagonal super villain lair.